BETTER than a new build for much less $$$! OWNER WILL PAY $4,000 (half) of social membership fee to match builder incentives! St. Tropez home in the Trilogy section of Encanterra is MOVE IN READY. 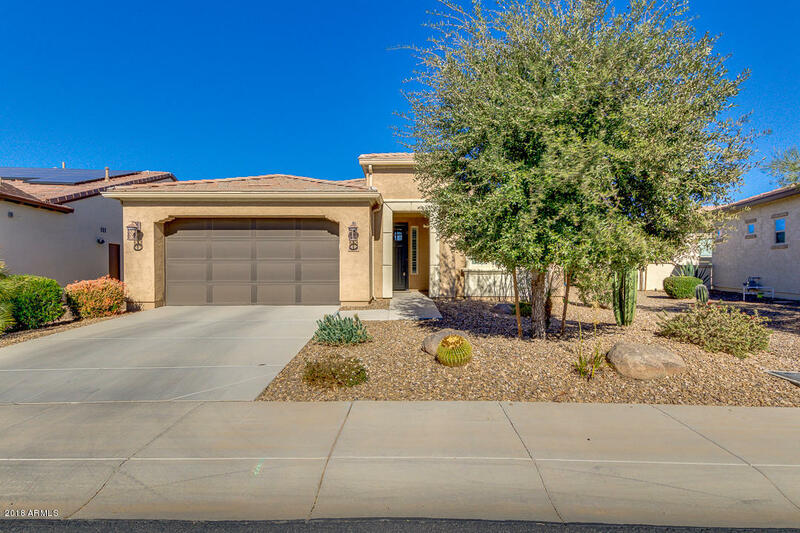 Designer upgrades including hardwood floors, crown molding, screened in patio with outdoor gas fireplace, central vacuum system, and whole home water filtration system - all on an OVERSIZED LOT that is fully landscaped with mature plants and fruit trees. Gourmet kitchen offers stainless steel appliances, double oven, pantry, granite counters & back splash. Solar System (20 year lease PRE-PAID by the builder, with option to extend) so TOTAL MONTHLY BILL FROM SRP IS ONLY $21! This gently lived in home has been INSPECTED AND FULLY CERTIFIED by OneGuard and Owner will provide a 1-year home warranty. This home is even eligible for an annual rebate from SRP based on electric usage. Solar System is no longer available on new builds. Come enjoy the "Good Life" in Encanterra, where owner members enjoy a resort lifestyle with facilities at 2 separate Clubs! LaCasa is a luxurious 60,000 square foot Club enjoys panoramic golf course vistas and includes best-in-class fitness facilities, social gathering spaces, fine dining, entertainment venues, an exquisite spa, tennis, swimming pools, and much more. The Algarve is the newest extension of the resort experience at Encanterra. The Algarve is an 8,000 square foot Club complete with a resort pool where you can enjoy poolside dining, an artisan studio, expansive open lawns including an indoor and outdoor concert area, eight pickleball courts, and bocce ball. In addition, Encanterra's private championship gold course was designed by PGA Tour veteran and former Ryder Cup captain Tom Lehman. Visit EncanterraGolf.com for complete information.